Almost a month ago, Notes covered the 2008 Otelia and it’s a pleasure to taste today the 2010 vintage. 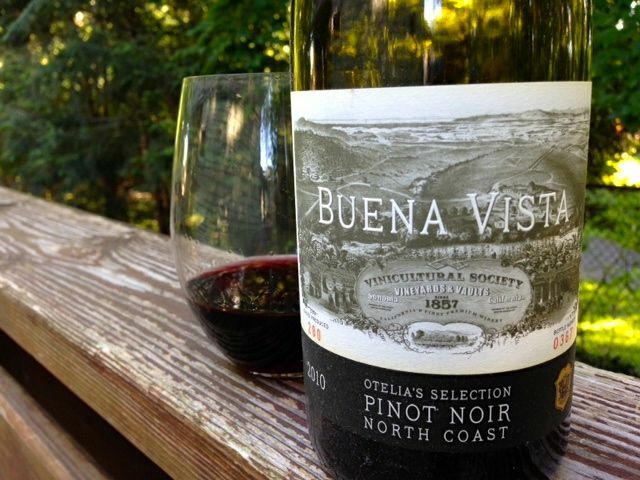 I have a tendency to save Buena Vista offerings for big occasions, but this one fell into “grip it and rip territory” and figured it was a much better option than the French Pinot Noir I had (briefly) considered as an alternative. Live for today, right? This Otelia first kept company with a simple meal of ground beef and pasta, its red-berried goodness working as an effective complement to the salt and spice of the dinner. The darker berries were evident on the nose, but I cannot say either my wife or I detected the orange referenced by the Buena Vista team. It is indeed smooth, however, and definitely finds an easy finish in your palate. Tonight the 2010 Otelia Pinot Noir will be served with barbecued chicken breast, crispy crown potatoes, and fresh corn off the cob. I’m confident it will play well with the carbs and spices, engendering not heartburn but a fruity mouthfeel that results in smiles all around. It has less of the earthy tone that I admire in Cabernets, but has the underpinnings of “velvet berries” that I often prefer in domestic Pinot Noirs. We’re finishing bottle number 0367 of only 280 cases, and that exclusivity helps me–whether artificial or actual–feel like we’re onto something special. Thanks to Buena Vista, you’re in good hands either way. Be sure to enjoy one of these for yourself. This entry was posted in Pinot Noir and tagged buena vista carneros, california winemaking, Sonoma, USA.